Food is our most intimate and powerful connection to each other, to our cultures, and to the earth, and to transform our food system is to take one giant step towards healing our bodies, our economy, and our environment. Crafted by 50 organizations representing rural and urban farmers, fisherfolk, farm and food chain workers, rural and urban communities, scientists, public health advocates, environmentalists, and indigenous groups, this 10-point platform serves as a call to action and a political compass for transformation. This platform is our roadmap, path to walk together into a future that truly nourishes our health, our economies, and our environment. Almost all of the food we eat passes through the hands of workers who harvest, process, transport, prepare, and serve it. The 21.5 million workers in the food chain constitute the largest segment of employment in the private sector. When the National Labor Relations Act and the Fair Labor Standards Act were crafted, they both purposely excluded workers in occupations dominated by former slaves, such as farmworkers and restaurant workers, and others. As a result, our current food system is devastating workers and their families and, by extension, our overall economy. Almost 90% of workers in the food system earn low or poverty-level wages. Ironically, food workers face higher levels of food insecurity than the rest of the U.S. workforce. There are exceptions, but many food workers experience work environments with health and safety violations, including wage theft, sexual abuse, threats of deportation, long hours with few breaks, and lack of access to healthcare benefits. 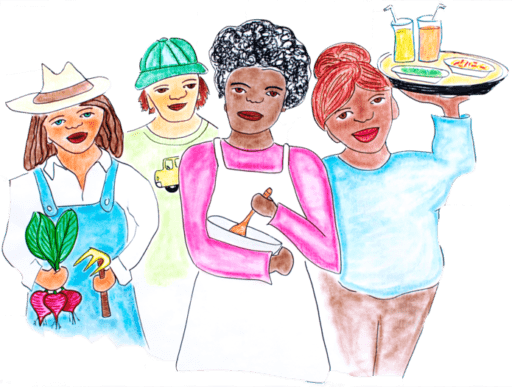 We want and need a food system that recognizes and values the important work of food system workers, and enables ALL people to work with dignity, livable wages, and meaning. Our food system should be managed by more cooperative ownership, and shaped more democratically by the decisions of the many, not the few. 8. Reform immigration laws. Create pathways to legalization for all undocumented people, included pathways to citizenship for all those that want it, and end deportations until a comprehensive policy is in place. 9. Establish federal programs to incentivize worker-owned food production, processing, and service cooperatives. The struggle to make it as a farmer in today still bears the strong imprint of a system developed by colonists, in which stolen lands were redistributed, and labor was stolen to work these lands. Racial, ethnic and gender lines further determined support for our food producers, including access to land, credit, insurance, technical assistance, and citizenship. Over the last 80 years, the number of farms have decreased - from 6 million to 2 million - while the size of them is growing: the top 10% in terms of size account for more than 70% of cropland in the United States. At an increasing rate our ocean commons - much like with land - is transforming into a private property asset, and the inequities we've seen on land are mimicking themselves on the water, displacing community-based fishers and undermining conservation goals. These lines continue to shape how the USDA, National Oceanic and Atmospheric Administration (NOAA), and other federal agencies assess whose labor and opportunities matter. Under the current system, federal agencies fail to recognize the way in which diverse producers entering the farming, fishing and ranching industries play a key role in the future of agriculture and seafood production. We need a system in which millions more people can thrive as farmers, fishers, and ranchers with the support of policies, not in spite of them. As a key pillar of economic development in rural communities, agriculture requires greater investment. We need farming systems that make it possible for farmers to continue to farm and pay their workers well and that supports those who want to grow healthful food in ways that are environmentally and culturally sound. We need to promote the success of independent farms and create pathways for new farmers. We must end discriminatory practices and open opportunities for people of color to access land and the resources needed to grow food for themselves and their communities. Farmers and food production are the foundation of a healthy economy. Over the last 30 years, the consolidation of companies in the food industry has reached historic proportions. For instance, just four companies control over 80% of the market for processing beef; just two companies distribute 75% of the food in this country; one company sells nearly one third of groceries. The system is functionally dominated by multinational monopolies, and these agribusiness and junk food corporations use their immense political and economic power to distort the market and maintain their stranglehold on our food system. These companies abuse their unprecedented buyer power to squeeze farmers and food chain workers further up the supply chain, and wreak havoc on our health and the environment in the process. We need democratic, transparent, community-controlled agriculture, fisheries and food systems in which all producers, especially those who have been historically marginalized, have access to fair and functional markets. These producers need to receive fair and stable prices above their costs of production that fairly compensate them for both their labor and management to ensure fair livelihoods for farmers, fishers, and workers. We need new governing structures that impose real limits on corporate power and the political systems that shape and regulate our food and agriculture systems, including trade deals. We need to ensure the protection of natural resources, public health, and fair working conditions in order to ensure that producers , workers and communities have the real power to shape food, fisheries, and agriculture systems. A resilient, regional food economy is about a “management of home” that allows us, and our neighbors, to thrive even in the face of adversity. This is especially relevant as we confront the impacts of climate change. It includes regenerative, collective stewardship of land, water, and other natural resources. 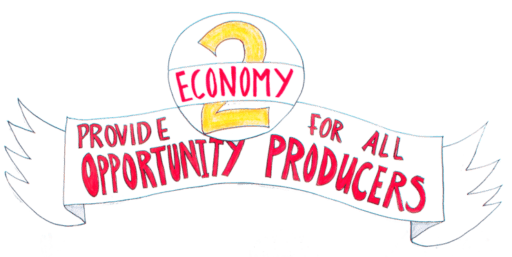 It’s an economy where there are vibrant opportunities for producers, distributors, and retailers to grow, process, catch, share and sell local foods; where workers are owners, and where local, healthy food is the easy economic choice. 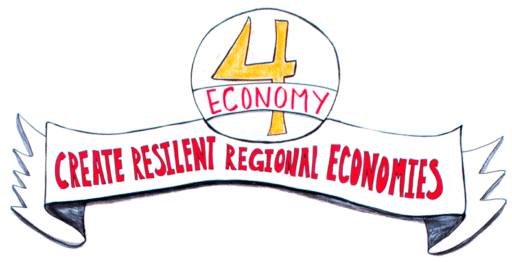 A resilient, regional food economy is about more than market-based relationships. It’s also about democratic governance: where local government and public organizations are accountable to an engaged populace. In this vision, cooperative ownership structures that generate real opportunities and wealth growth for low-income communities and communities of color are encouraged and supported. And it’s about meaningful work and relationships: where informal economies and traditional food ways can flourish; where human relationships and a sense of purpose are nurtured; and where there is understanding and reciprocity in our relationship with each other and the earth. The diet-related public health crisis we face can be counted in declining life expectancy and in dollars (for example, the U.S. spends $200 billion annually in obesity-related healthcare costs), but it will be experienced as the physical pain of heart disease and cancer, as limbs and eyesight lost to diabetes, and as family members who are missing from holiday tables. A driving factor is the ballooning omnipresence of junk food and junk food marketing. Multinational food and beverage companies currently spend billions every year on marketing, including at least $2 billion in marketing directly to children. And this marketing is everywhere and disproportionately targets communities of color. Regulations on such marketing are scant, and the food and beverage industry has long wielded its political power to fight any regulation. Simultaneously, the production of many of their ingredients, and even their marketing practices is highly subsidized. 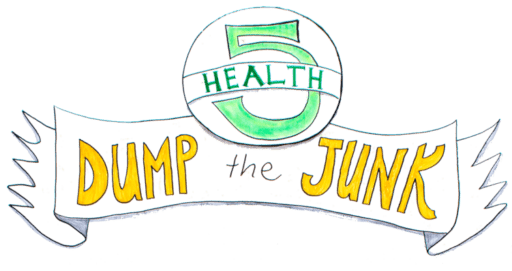 Yet the highly processed junk food and sugary drinks - so heavily promoted in communities of color and to children - are driving a public health crisis through an epidemic of diet-related chronic diseases. The predatory marketing tactics that these companies use to target children and communities of color must be stopped. We also recognize that we need to work with international partners and fight for multinational regulatory and policy solutions so that corporations don't continue employing these practices with impunity outside of our borders. 3. Treat junk food and beverage companies like tobacco companies: hold companies liable for health impacts, and include visible warning labels, restricted advertising, barriers to purchase, and taxes that are re-invested in community. As a study by the W.K. Kellogg Foundation found in 2007, it is almost impossible for the typical American to eat a meal without one hidden cost or another - whether those be to our health, to the environment, or to farmers, fishers, and workers. We’re faced not just with an absence of information, but a blizzard of confusing and misleading information. Indeed, many food companies actually benefit from this confusion; they can market new products according to the latest health fad. A recent Oceana report found that around 30% of all seafood in the U.S. is being mislabeled. We need a food system that replaces deliberate confusion with deep knowledge, and in which clear, accessible, and accurate information gives all people the power to make effective decisions about what we eat and how our food economy should be structured. Nutrition and health care professionals play a key role in shaping the "food literacy" of our public, and schools play a special role in shaping the tastes and "food literacy" of the next generation. We envision gardens and good, healthy food in every single school building, but understand that there are other critical levers to pull as well. These range from a strong labeling system to knowing who gets how much profit in the industry to protecting the ability of people to investigate wrongdoing. We have a right to know what's in our food! And we want more people of all ages to have direct experience with farming, fishing, ranching, and food production. Over 42 million people nationwide struggle every day to get a meal, let alone one that will truly nourish them, support the farmers, fishers, and workers who produced it, and preserve the environment (what we call “real food”). While we can make healthy food more accessible through a variety of supports, incentives, and innovations, we ultimately need to create economic opportunities to ensure all people are able to afford real food that reflects our different cultures. This includes securing a living wage and dignified conditions for working people, and more opportunities for decentralized ownership and control of food system infrastructure. We also need to support people to produce their own food - self-driven food production is the most empowering and lasting means to achieving food security. The food system itself can be a tool for fighting inequality, creating jobs and community wealth, and bringing food within reach of everyone. The Intensive production of unprecedented numbers of animals in confinement (Confined Animal Feeding Operations or CAFOs, better known as factory farms) is an unmitigated disaster for rural communities, public health regional economies, and the environment, as factory fishing and industrial aquaculture are or costal communities, family fishers, and marine ecosystems. With negative impacts on workers, water, animals, communities, and the climate, factory farming and fishing are simply not conducive to a just and sustainable food system. * diversification of ownership, including farmer, fishers and worker ownership, from producer, to processor, to manufacturer. 3. Align federal subsidies with conservation principles and in support of small/mid-size farms. In today’s agricultural system, grass-based livestock operations are giving way to confinements, while small and midsize diversified crop operations are losing ground to monocropped mega-farms. A similar phenomenon is happening on the oceans, with independent boats being replaced by industrial trawlers. We must stop this life destroying, dangerous trend. We need the dominant food production practices to be of net benefit to the environment -- to increase topsoil, store more carbon, and enhance biodiversity. To accomplish this, the policy infrastructure that supports food production, from research to technical assistance to insurance and credit, must primarily encourage the integration of the best of cutting edge agroecological science with the best of time-honored indigenous wisdom and agricultural traditions. Supporting this shift both domestically and internationally is necessary for the world to feed itself. Policymakers must recognize the impacts of other industrial activities, like deforestation, mining and fracking, on fish populations and ecosystem management. The protection and development of sustainable farming, ranching, and fishing systems will support ecological health and public health, with safer environments for farmers and workers and more diverse, nutrient-rich diets for everyone. The current dominant agricultural system is setup to produce waste at every stage of the food chain, from farm (e.g. excess chemical fertilizer, pesticide, and herbicide runoff) to consumer: 40% of food intended for human consumption is wasted, and our food and agriculture system accounts for a third of greenhouse gas emissions. This waste has ethical, environmental, and economic ramifications. We need to close the loop and ensure that the true cost of food is accounted for throughout the supply chain, discouraging overproduction and damaging environmental practices, integrating agroecological and ecologically responsible fishing and farming practices along the way. We want a food system that ensures the full use of food produced - including animals captured at sea - from human consumption to composting and recycling; and recognizes the true value of natural resources that go into food production and maintaining them as a public good.